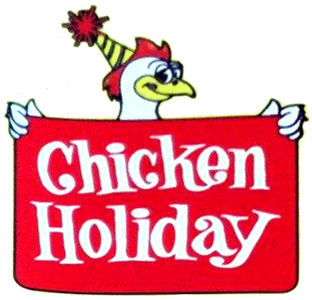 Online ordering menu for Chicken Holiday. Here at Chicken Holiday, we serve the tastiest Chicken and BBQ in Marlton! Order our famous tubs of fried chicken, up to 100 pieces, or order your Chicken by the piece! Try our Bar-B-Cue Beef entrees and our seafood entrees like our Jumbo Shrimp or our Nine Rib Order! Also try our variety of specialty fries like our Gravy Fries, Seasoned Fries and our Potato Wedges. We also offer sandwiches like our Chicken Caesar Wrap or our Buffalo Chicken sandwich! Order carryout online and find us at the corner of Church Road and Maple Avenue, in Crispin Square!